Usually if we need capture screen shot video we need use some software like Camstudio that is a useful free software. Do you know we have another way to do that job without any software? ScreenToaster is an online screen record tool that allows you record your screen activity. Like other screen capture software it also offers whole screen record or just part of screen record. 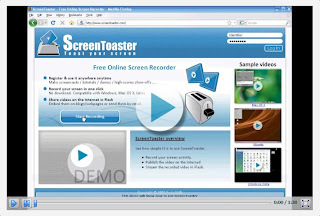 If you know how to use screen capture software you will know how to use ScreenToaster, almost same function. Now, ScreenToaster is a beta version, only for some people who have invitation to register. You can leave your email address on its main page, you should be get an invitation quickly.